Victor and Huguette Germain have a long restaurant history in Quebec City. During the mid 1980’s, upon visiting New York City’s Morgans Hotel, their children Christiane and Jean-Yves Germain fell in love with that hotel’s boutique concept and decided to create a similar property in Quebec. In 1988, Canada’s first boutique hotel, Hôtel Germain-des-Prés, opened, soon followed by Le Germain (and Alt) hotels in Montreal, Toronto, Calgary, Halifax, Ottawa, St. John’s and Saskatoon. Second Alt Hotel locations will appear next year in Calgary, St. John’s and Saskatoon (hopefully Vancouver isn’t too far behind!). Le Germain is the luxury hotel component; Alt Hotels are their paired-down, reasonably priced little cousins. 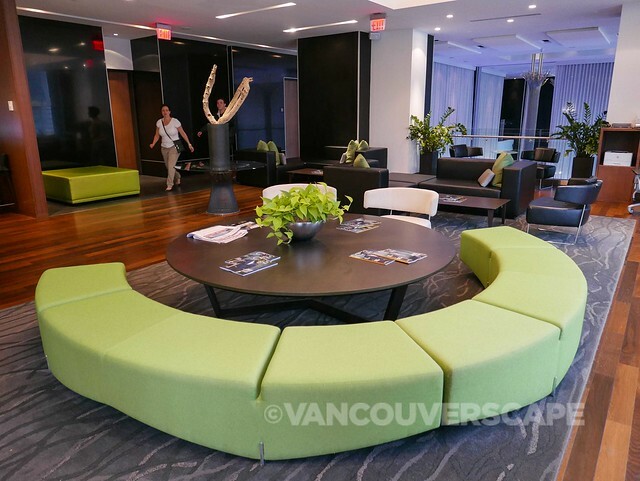 Both brands fall under Group Germain Hotels and several properties are recipients of multiple hotel awards, from Trip Advisor Certification of Excellence to CAA/AAAA Four Diamond designation. There’s currently 13 properties with plans to expand to 20 by 2020. 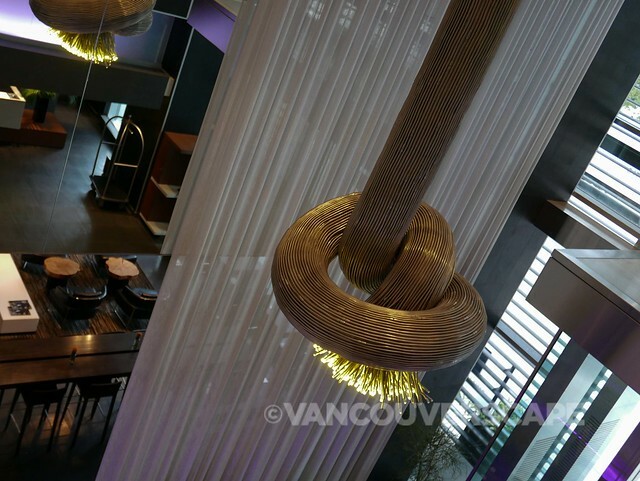 At Hotel Le Germain Maple Leaf Square, beautiful hanging metal chandelier The Knot greets you as you enter the lobby, setting the stage for a luxury experience in the heart of Canada’s largest and liveliest city. 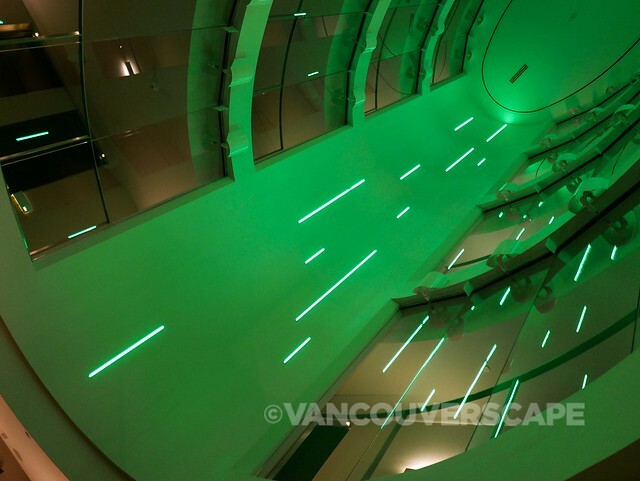 The huge glass ellipse glows green right up to the eighth floor, changing to blue during Blue Jay games and to red during Raptors matches. The hotel focuses on local artists, top-quality furnishings and clean lines, and that comes through in spades as I walk around the lobby and adjacent Play Lounge, open from 11:30 am to 1 am weekdays (4 pm to 1 am weekends) for lunching, lounging, beer, wine and cocktails. 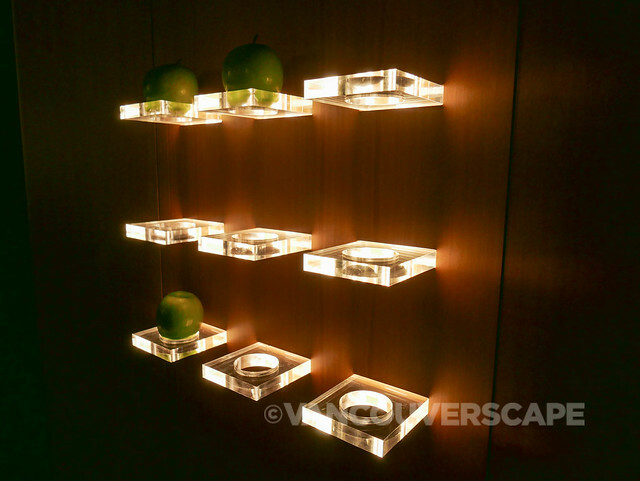 There’s green apples appearing on a series of tiny plexiglass shelves near elevators, great for impromptu snacking. Speaking of snacks, just outside the lobby and down the stairs is Longo’s, an enormous supermarket great for getting sandwiches and snacks on the go. There’s a sushi chef onsite too, very handy for taking a sushi box to the airport for your flight or train home. 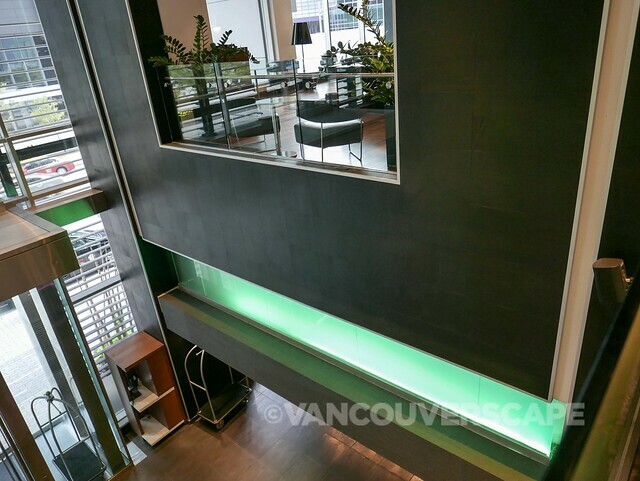 Walking through the entryway leads to a beautiful and spacious room with large windows, a desk and counter across its length and a big rain/handheld shower off to the side. 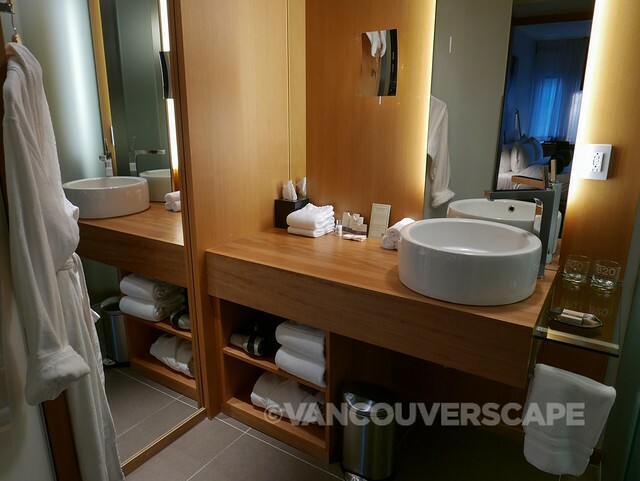 There are several pull-out areas revealing a full-service ironing board and iron, refillable water carafe and drink ware, media strip and small bedside shelf. 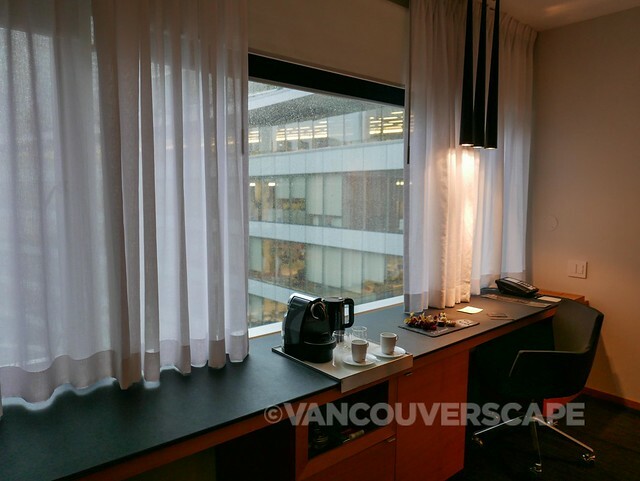 Lots of black-stained concrete, light wood and sleek light fixtures add a considerable flair to the 167 rooms (including 24 suites) here. 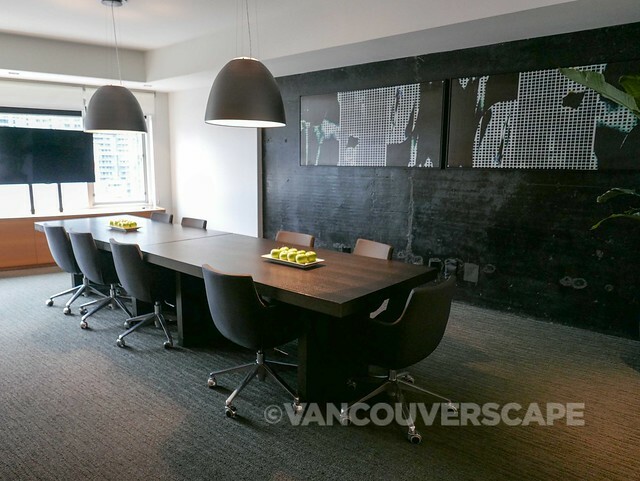 Heavily influenced by the sports scene due to its prime location at Maple Leaf Square, each room features one of 24 oversized black and white photographs of the Toronto Raptors by local photographer Matthew Plexman. 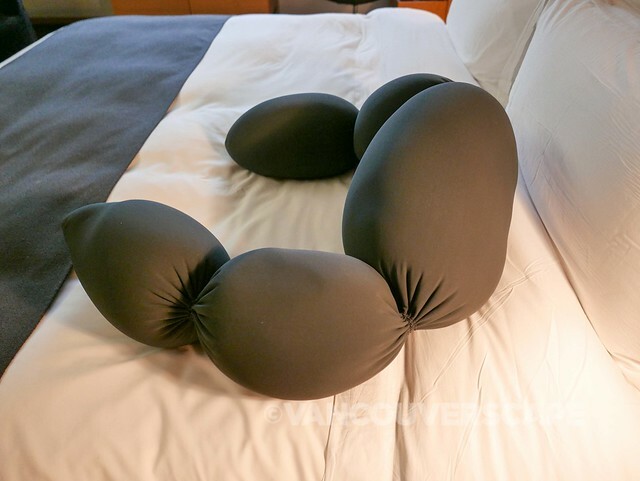 The very cool sectional black pillow by Montreal clothing designer Marie Saint Pierre can be shaped in a number of ways (and I’ve been told it can be thrown in the washing machine and dryer). The black seating ottoman is inspired by a hockey puck. 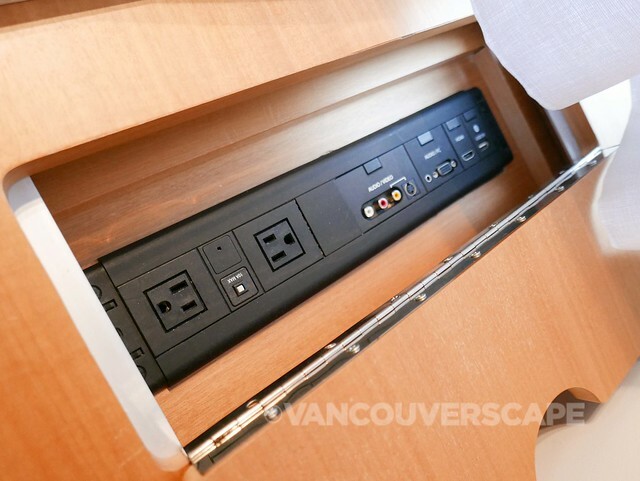 I like the panel by the bed with ambient and normal light buttons. A couple of reading lamps on either side make for a great unwind after a long day. I never turned on the wall-mounted flatscreen TV but imagine it might come in handy during an away game or catching a movie. I’ve done a sizeable amount of hotel stays over the years, but the super-soft bedding at Le Germain is some of the softest I’ve ever felt! It remains cool to the touch during the night and made getting out of bed a hardship each morning. Luckily the collection can be purchased at eight Simon’s department stores (including Park Royal in West Vancouver). 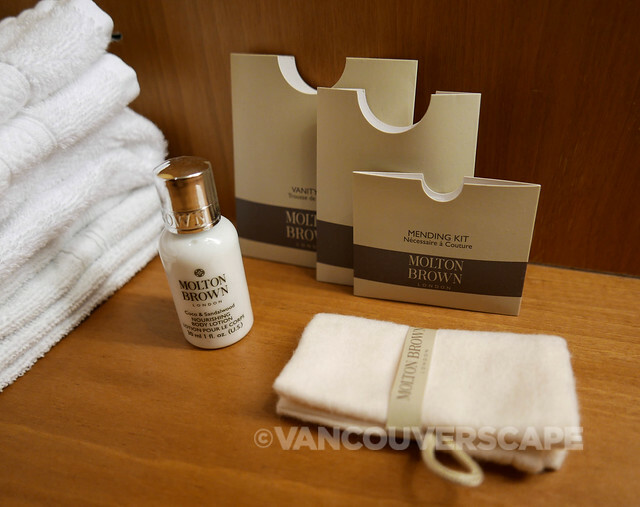 Le Germain uses Molton Brown toiletries. In the large dual shower are wall-mounted shampoo, conditioner and shower gel by the popular UK brand. 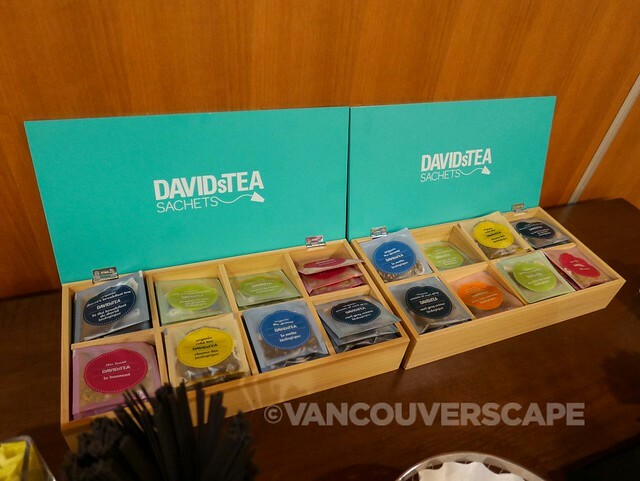 David’s Tea, a BODUM water kettle, Nespresso machine and mini fridge can be found under that long desk counter together with a mini bar. I noticed the free wifi works great throughout the hotel but on the eighth floor can be intermittent (particularly at night). The spotless rooms are meant for relaxation and tranquility, which I definitely experienced during my stay. The staff are helpful and take pride in the hotel, which helps make Le Germain one of Canada’s 50 Best Managed Companies to work for, six years straight and counting. 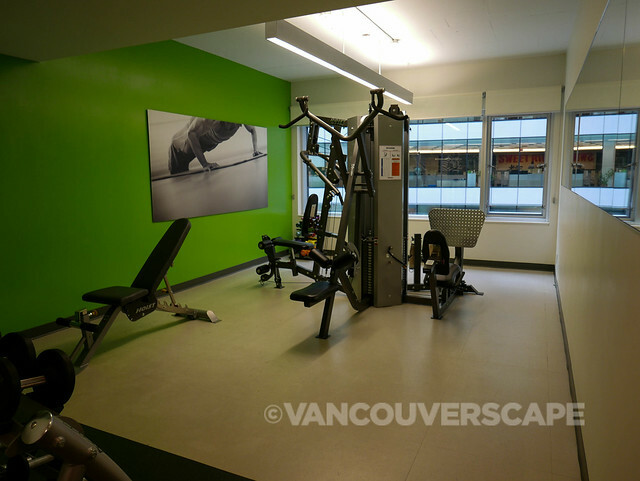 The 24-hour fitness room contains treadmills, elliptical machines, stationary cycle, free weights and an adjacent stretching space, where guests can borrow Lululemon yoga mats—a new partnership between the two companies. Meeting rooms are aptly titled Neutral, Defensive and Offensive Zones, the Penalty Box offering an amazing view of the action outside during big sporting events. 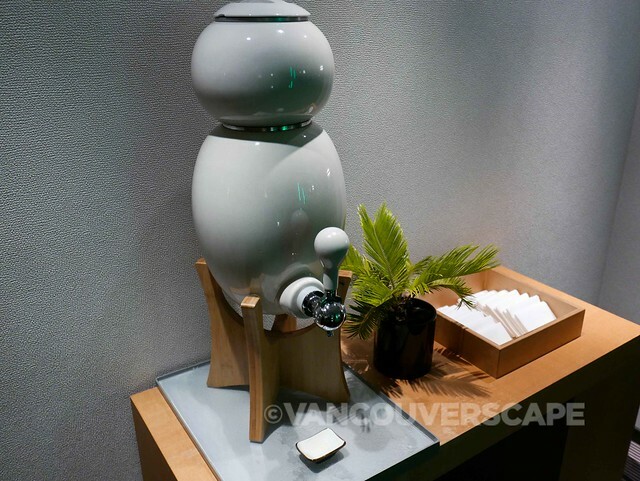 OVOPUR Quebec provides white porcelain filtered water reservoirs on each floor. 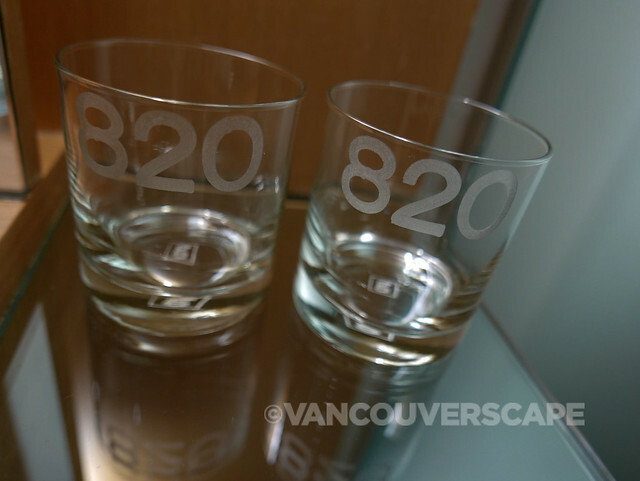 Guests simply bring the carafe into the hallway and fill up. Small measures like this save the hotel and our environment (70,000 bottles in the Toronto Mercer location alone) each year. 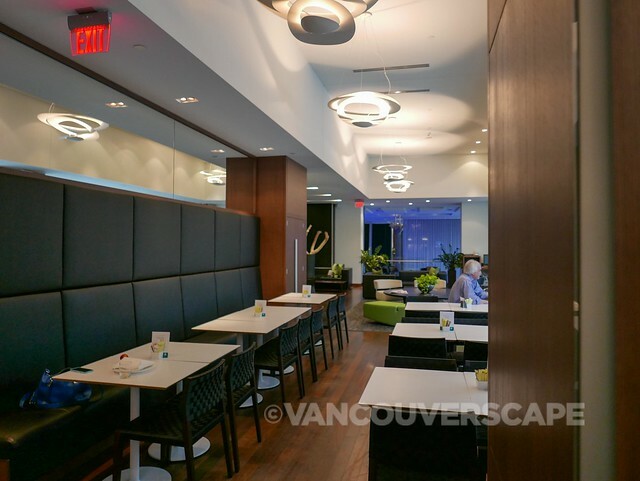 The breakfast room is on the second room and gets divided between table seating with a TV screen and a lounge with high tables and views overlooking Maple Leaf Square and Union Station. I applaud any hotel chain that gives guests the option to NOT have to watch or listen to the drone of TV sets first thing in the morning. What I found when I entered this room was lounge music that felt gentle on the soul, particularly after a couple of late nights enjoying the city’s vast array of nightlife and cultural offerings (Nuit Blanche, Friday Night Live at ROM!). 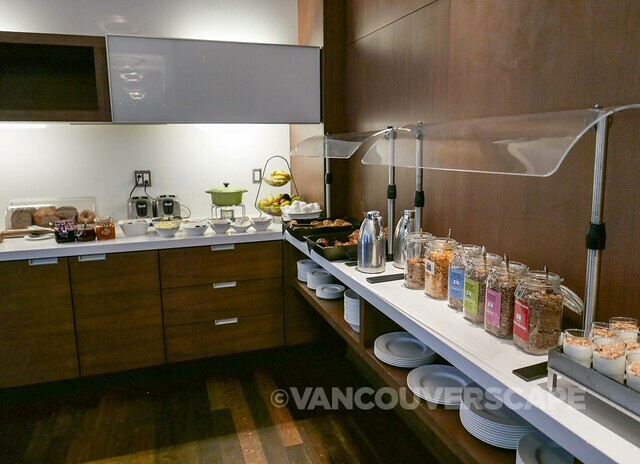 A big green Le Creuset pot holds hot oatmeal; bowls of fresh fruit, a variety of granola, breads, pastries, juices, coffee, tea and hard-boiled eggs complete the deluxe continental breakfast setup. As mentioned above, the Play Lounge is open for lunch, cocktails and post-game victory celebrations. The Le Germain Maple Leaf Square is located a five-minute walk from Toronto’s Union Station and about a 10-minute walk to Harbourfront and many of the city’s top attractions including CN Tower, Rogers Centre and Ripley’s Aquarium. Whether in town for business or pleasure, you couldn’t ask for a more convenient spot to call home while in Toronto. Speaking of handy, the UP Express whisks you off from Union Station to Pearson Airport in around 25 minutes, only stopping a few times en route. I’ve used this service in the past and have found it a stress-free way to commute to the airport and back without worrying about traffic jams. 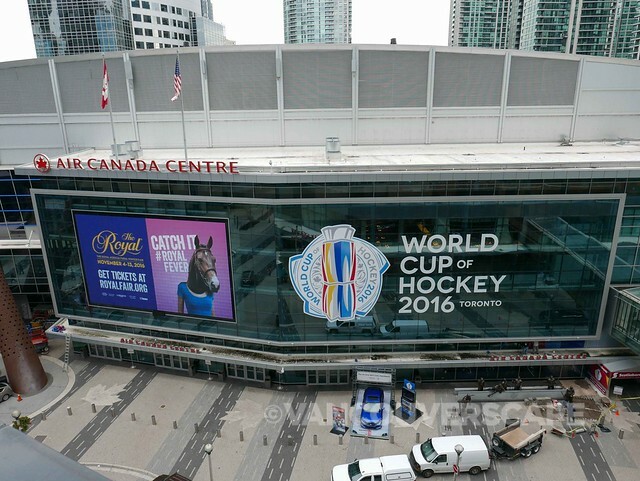 Depending on the location of your room, you may find the intermittent flashing from Air Canada Centre’s enormous electronic billboard bothersome. If so, I’d suggest requesting a room on the opposite side of the hotel. I was out during the day and used the blackout curtains at night, but did notice it in the mornings. It’s just a part of being in the center of the action, I suppose. In keeping with a growing trend, Le Germain also has a cool online deal going if you book with them directly: no check out time! Book via the site or over the phone and check out is whenever you’d like it to be—free of charge (dependent on whether a special event or circumstance is already in place on your departure date). I was hosted at Hotel Le Germain Maple Leaf Square courtesy of Tourism Toronto. Opinions, as always, are my own.